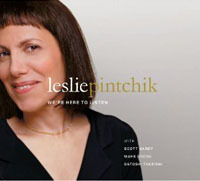 On this, her sixth album, pianist Leslie Pintchik shows that she can compose distinctive melodies. 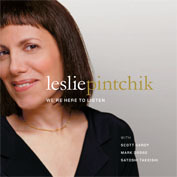 All of the original compositions she does on this CD are bright and memorable and even the two standards she covers are given surprising arrangements. 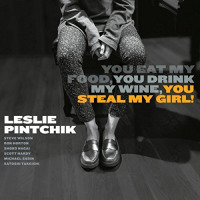 She establishes herself from the beginning with the uniquely-titled "You Eat My Food." This turns out to be a nice piece of surging jazz-funk in the manner of early Herbie Hancock with a serpentine piano line and pithy accents from the two horn players. It also features sharp, wailing solos by Steve Wilson on alto sax and bassist Scott Hardy doubling on electric guitar. "Mortal" is a ballad that showcases Pintchik's quietly dramatic ability at slow tempos and has gorgeous solos by Wilson and Ron Horton on flugelhorn. "Your Call Will Be Answered...," the other tune with a mouthful of a title, shows how hard Pintchik can swing in a pure piano trio format accompained by Hardy and drummer Michael Sarin. Shoko Nagai's accordion adds exotic elements to the music on "Hopperesque" and "Happy Dog." The former has a slowly swirling tango feel and the latter emerges as a swinging samba. 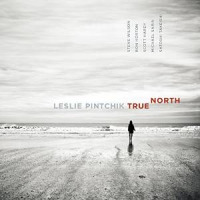 Both provide space for Pintchik's piano to really sparkle amidst complex rhythm work. The closing ballad, "A Simpler Time" has a pretty, sentimental theme that is played by the group with delicacy and care. As for the two standards they both get slightly unconventional treatments that benefit them. "I'm Glad There Is You" is played as a slow, romantic bolero and "Smoke Gets In Your Eyes" is set to a sly Latin rhythm with a heavy groove set by Hardy with Pintchik's playing coming out both subtle and frisky. This is an excellent set of piano-led jazz, alternately funky and tender, playful and profound. 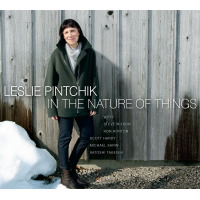 Leslie Pintchik can play with as much verve and feeling as any other mainstream pianist around and she also writes exceptional tunes.